A Utility Task Vehicle (also known as side-by-side or SxS) is a rugged off-road vehicle intended for labor more so than for sport. UTVs are drastically different from their ATV cousins in terms of application. A Utility Task Vehicle in is designed in most cases to carry heavier payloads separate from the weight of the operator and passengers. Much like the Hammerhead off-road R-150, most UTVs are designed to carry payloads. Their lower load-position increases its stability, substantially lowering the center of gravity, which should prevent it from rolling over on steeper terrain. The machines should be able to easily navigate off-road while carrying a heavier load of equipment than do ATVs. While being able to complete the working function, it can maneuver around obstacles and remain stable over rough terrain. It is capable of carrying heavy loads while staying on top of softer ground surfaces. When you have a job that is in rough or rural terrain that requires hauling or towing. 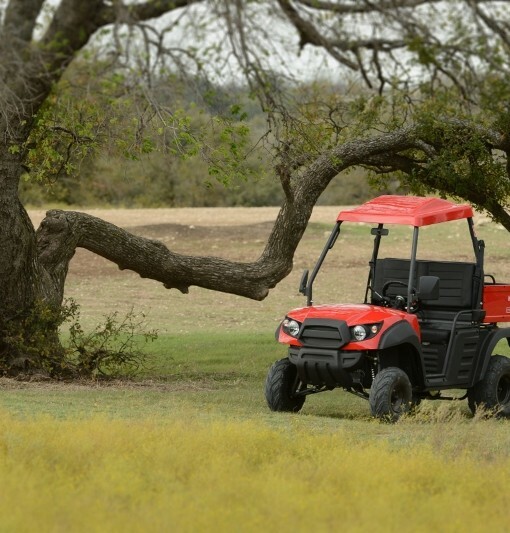 You are performing work that requires a specialized all-terrain vehicle. UTV’s are very customizable, allowing for their owners to fit them out in order to tackle any type of job that is off the beaten path. If you are the outdoors, off-the-grid type, this type of off-road vehicle is perfect for those who live in the wilderness. Low operational costs compared to using larger off-road vehicles. We have been distributing off-road vehicles in the United States since 2003. Hammerhead Off-Road is centrally located in Flower Mound, Texas (a suburb of DFW) where we stock all of our parts inventory and diverse product lines.